> Panic as motorists slapped with fake summons! 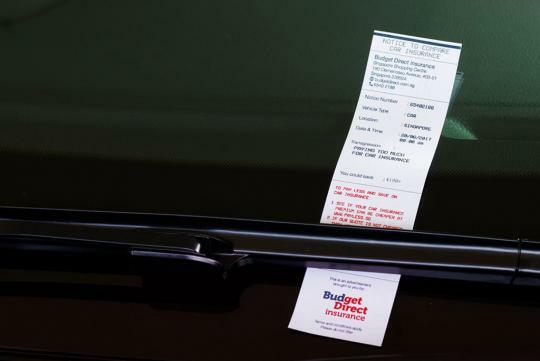 Nearly half a million motorists woke this morning to discover they’d been slapped with a ‘parking summons’. The stunt was part of a major marketing campaign by new online insurer Budget Direct Insurance. It is believed to be the first time a marketing ploy on such a scale has been attempted in Singapore. Named Operation National Summons, it was planned with military style precision. Around a 300-strong team was deployed at car parks across the island. Working throughout the night, moving around like ‘summon aunties’ in a tightly coordinated operation to cover some 2,000 car parks. The aim of the campaign is to highlight the insurer’s promotion of ‘Pay Less or get $100’. If motorists get a cheaper quote elsewhere for their car insurance renewal, then Budget Direct Insurance will pay them $100, even if they don’t buy. In a competitive market, Simon Birch, CEO, recognises insurers have to work harder and smarter than ever before. To register for this promotion, visit www.payless.sg. Visit www.budgetdirect.com.sg for a quote today. Catchy campaign but there’s been many complaints about Direct Asia’s limited coverage and strict terms and conditions, ie. car must not be used for work purpose, meaning your car is not covered if you use it to drive to work. Premiums can be lower than competitors’ but the limited coverage is a turn off. This is an issue that Direct Asia must address. make pple tulan is good marketing & PR? No didn't read at all. Once i saw it was marketing writing, i tore it up. All such flyers on windscreens are littering acts on private property. Rubbish. Did the people at Budget Direct think that this is funny or appreciated by owners of the vehicles? Because of their stupid marketing ploy, this is another reason not to buy from them. This is akin to Budget Direct leaving rubbish on our vehicles. NOT appreciated or wanted!!! Whoever thought of the idea has no idea of the profile of drivers in singapore. Bad taste marketing and they sounded so proud. Pissed me off enough to write them off permanently. Am sure many feel the same. What sort of marketing brain is this ?